Home → News → Celebrate National Library Week 2015! 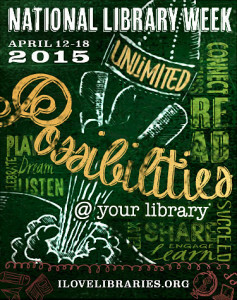 Celebrate National Library Week 2015! This week, Portland State University Library joins libraries in schools, campuses, and communities nationwide in celebrating National Library Week, a time to highlight the changing role of libraries, librarians and library workers. Libraries today are more than warehouses for books. Instead, libraries and librarians are change agents within their communities, transforming lives through innovative educational resources and forward-thinking programming. Libraries are doing their part to close the digital divide and level the playing field by providing free access to information and technologies that many in their communities would be hard pressed to find elsewhere. Libraries help to ensure the American dream and promote democracy by providing service to all regardless of race, ethnicity, creed, age, ability, sexual orientation, gender identity, or socioeconomic status. Portland State University Library serves Portland State University by providing databases, electronic and print books, journal subscriptions, research help, technology, and a range of study spaces.